If, like most professional photographers, getting found by the right people matters to you but you’re not seeing the results you want, you’ll love what I’m going to share with you here. Some of these ideas on doing SEO for photography blogs might even come as a surprise or a revelation, but I promise it will be well worth our time together today. Now it’s time to talk about the super-exciting and thoroughly entertaining world of SEO for photography blogs. Yes, I know it might not sound that exciting right now, but you’ll be in love with it by the time we’re done here. There’s a lot of nonsense talked about search engine optimization, and SEO for photography blogs in particular, some of it left over from the last decade that’s no longer relevant, but which many photographers can’t seem to shake off for one reason or another, so I hope this will help eliminate some of that for you. If you’re not quite up to speed on the wider topic of optimization, check out the complete SEO For Photographers Made Simple guide. You’ll also see that doing SEO for photography blogs is a LOT different than it is for many other businesses, and that we need to take the generally-accepted ideas about SEO and translate them into something more appropriate to what we do. In fact, I’ve personally felt for a long time that even the phrase “search engine optimization” itself has become something of a misnomer, and no longer fully represents what it is that we’re really aiming for in today’s world of content marketing. SEO always seems to bring to mind Google and the various tactics marketers have used over the years to try to outsmart the search engines, or to manipulate Google in some way, but we’ve really evolved a lot further than that. While we still think of it as SEO, at least for now, what we’re really doing is helping people to discover our photography and the stories we tell around our photographs so that we can connect with them in ways that lead to us booking more of the clients we love to work with. This idea was actually the topic of a great episode on the “Hit Publish” podcast from Rainmaker FM called SEO: How To Sweat The Right Stuff where Sean Jackson talked about the idea of maximizing content discovery rather than pure search engine optimization. That said, you should still consider making sure that Google understands what your website and blog are talking about, which is what we’ll get into here. Before we jump in, think about the last thing you searched for on Google. Hopefully, it wasn’t something you were in desperate need of, such as an emergency plumber or the nearest bail bondsman’s office, but it’s very likely you were looking for the answer to a question, such as where’s the closest Italian restaurant or who wrote a song you just heard on the radio. What did you last search for on Google? 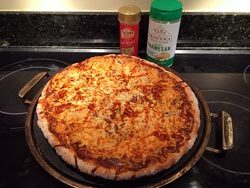 I found a recipe for BBQ chicken pizza that turned out so well it vanished before I could take a professional photo of it (sorry, this was the best I could do while fighting people off LoL). Me? The last thing I looked for was a good recipe for homemade BBQ chicken pizza (which I’m looking forward to making later on). But, more often than not, your search journey usually doesn’t end with a simple Google query and one click. Granted, if you need an emergency plumber, there’s a good chance you don’t have the luxury of delving much deeper into it. Your house is rapidly filling up with water and you need someone – anyone – to come and put a stop to it right now, and you almost don’t care about the cost as long as you can put an immediate end to the misery. But what if you’re looking for a babysitter, or a fancy restaurant for a very special occasion? Unless you don’t mind handing your kids over to complete strangers for the evening, or spoiling a romantic dinner with a bad meal, it’s very likely that you’ll go beyond the Google search to find out more about the options that come up in that search, right? It’s important that you make the best choice, so there’s bound to be some additional research needed. In that regard, Google has become more like an online dating service than simply a mere search engine, matching you up with service providers who it thinks are the best fit for you, based on many factors, including the content they have on their website and what others think about their service. For that reason, it’s no longer enough for professional photographers to show up on page one of the Google search results. To get the new clients you want in the numbers needed to sustain your photography business, there must also be more substance to your online presence in the form of reviews, endorsements, and in-depth content, as well as a good social media footprint. Which is one very good reason why every photography professional should have a blog. In case you’re not sure why a blog is such an essential part of your marketing efforts, remember that professional photographers are in the people business. We have a unique relationship with our clients where our personality, artistic talent, style, inspiration, and a process of mutually-driven creativity all play key roles – there is no room here for mediocrity! It’s very hard for a basic website on its own to communicate those qualities in ways that come across naturally. A blog, on the other hand, is the ideal platform giving your customers and prospects a peek behind the curtain, as it were, into the heart of your business and the passion that drives it. That’s the real reason why your blog exists – to connect with your customers in a way that helps them feel like they really know you on a personal level, and to help them overcome much of the natural sales resistance we all have, especially if they don’t yet know who you are. As soon as photographers think about starting a blog, their thoughts immediately seem to focus directly on all the supposed SEO benefits of blogging, and the difficulties that entails, instead of focusing on the real reasons I just mentioned. I’m guessing it’s because there’s so much information on the Internet that connects SEO and blogs together as if they’re inseparably married to each other. Because of that we’ve all come to forever associate WordPress and blogging with the need for search engine optimization. Which is a real shame because, in a lot of cases, it’s actually doing more harm than good for many professional photographers who become enslaved by the idea that says you have to do SEO on every blog post. For example, I frequently encounter blog posts with weird-sounding titles like, “Baby John portraits by newborn baby photographer, Dallas, Texas” when a much simpler and creative title would grab more of the reader’s interest and attention. What typically happens is we get all wound up about the apparent need for SEO, and start stressing out over where to put keywords in posts, but it’s all so unnecessary, as you’ll see if you stick around. Because the truth is, blogging does NOT equal SEO. Where did this misconception come from to begin with? If you search the web for SEO and blogging or SEO and WordPress, you’ll most likely see a bunch of articles listed in the results, all talking about how to use a blog to rank for specific keywords in the search engines. Although a lot of it is a bit out of date, much of that information is still fairly accurate. The problem is, most of that information is written for people like me – Internet marketers who want to reach a large audience with a wide variety of sub-topics. For example, I talk about blogging, email marketing, how to use social media, how to build effective photography websites, lead generation, and pretty much anything to do with online marketing for professional photographers. That’s a lot of topics with many possible keywords and phrases contained within them. But that probably doesn’t describe you and other photography professionals, does it? For the most part, you operate within a relatively small geographical area, and serve a small subset of that population with certain types of photography. Because of that, the number of keyword phrases you can realistically target through search engine optimization is pretty small. Those keywords are still a good source of visitors, just limited in number. As you’ll see in a minute, this has big implications for best practices when it comes to SEO for photography blogs. I mentioned earlier that SEO is becoming an outdated term, and we need to be thinking more along the lines of helping people to discover our content instead of simply looking at boosting search engine rankings through sheer brute force. It’s really no longer just about keywords. Yes, they’re still a big part of the game, but there are now so many more pieces at play on the board than there used to be. That’s because Google is now much more focused on other factors. The relevance of your content to your intended audience. In other words, how good a fit is your blog to the people who you want to attract to it? Does it answer their questions? Does the design of your blog enhance the content or does it get in the way with unwanted distractions? How do your visitors behave once they land on your blog? Google also attempts to home in on the authority of your website and blog. How long has it been around? How often do other blogs and websites link to your content? Are those links coming from relevant websites, or are they from non-related sites that look more like link-spam? Are your posts shared across social media? If you have comments enabled, do those comments enhance your posts, or detract from them? The depth of your content is another big factor, and frankly one that scares the lens caps off most photographers because it involves the “W” swear word – “writing”, While there’s no real way around the need to create deeper blog content, that doesn’t mean it has to be complicated. Simply relax, and write from the heart. You can also include the words of your clients through testimonials. Although you do need to use actual words, you can embellish it with other media, such as video. Another major factor is the consistency and tone of your voice. By “voice”, I’m referring to the words you use, the way you construct your sentences and paragraphs, and how closely that resembles the way you would actually talk if your were speaking to someone about your photography. There’s no right or wrong way to do this, and it’s something of an enigma because it’s both the easiest and hardest thing to do all at the same time. In the end, it comes down to letting your personality guide your content, and all it takes is some practice. Trust me, if a self-confessed left-brained logical geek like me can do it, so can you! Google also looks at things like the user experience on your blog. This one is about to become even more important, since Google recently announced their intention of including mobile responsiveness as a ranking factor in search results made on mobile devices. In other words, if your site looks crappy on a mobile, you run the risk of being penalized for it. Luckily, most WordPress themes these days are mobile responsive but you should aim to correct that now if you yours is not. The big takeaway here is that the focus of SEO for photography blogs has changed drastically from being mostly about keywords to something far less tangible and much harder to fake. If you think back to the heydays of SEO, ranking signals were thought to be made up of 25% on-site keywords and 75% off-site and other factors, but it’s now more like 15% and 85%, if not even more skewed than that. If we combine the fact that on-site SEO has diminished in power for the average professional photographer with the small pool of available keyword phrases, it becomes apparent that we do need to become better at knowing exactly when and where to optimize our content for specific keywords. This is why I tend to fly in the face of the commonly accepted SEO advice by saying that you don’t need to worry too much about doing pure SEO on your regular blog posts. Not only would you have to repeat your keywords very quickly, because there aren’t all that many to begin with, there are better places on your website and blog for you to do that than on blog posts. Besides, trying to stuff keywords into your blog posts does nothing to improve the readability of your content, or make it more appealing and engaging – quite the opposite, in fact. Given the fact that relevance, authority, and your personality are important signals for the search engines anyway, why would you want to wreck all that by appearing all needy with Google? Instead, focus the optimization you must do on pages of your website that really matter to your audience, such as your home page, FAQ pages, your “about” page, and on valuable resource pages that you create to inform and connect more deeply with your target clients. In fact, you can’t go too far wrong by only doing serious SEO on WordPress pages, and only concern yourself with the user experience elements of SEO for posts. If you think about it, this makes your life as a photography marketer so much simpler, and removes much of the pressure many of us feel about the whole SEO issue. It’s quite liberating to be able to write a blog post without having thoughts of SEO and Google nagging at you the whole time. The only SEO-related task you should be concerned about with your blog posts is to remember to link to your important pages and resources whenever you mention those topics in a post. Doing so will boost the rankings of those pages, and help Google to understand their relative importance in the grand scheme of your website as a whole. One important tip that many photographers may be unaware of is that you can control which of your content actually gets indexed by the search engines, and you can easily exclude certain pages of your site from being shown in the search results. Why would you want to do that? After all, it seems a bit odd to deliberately exclude your content from Google, doesn’t it? Your content will be set to index by default, but you can easily change that to “noindex” on any page or post in the advanced tab of the WordPress SEO plugin. Keeping unwanted pages out of the search engine index will not only stop visitors from ending up in the wrong areas of your website or blog, it will also help Google do a better job of serving the right pages to the right people at the right time. I hope this is helpful for you, but what can you do if you need help figuring out how to make the most of WordPress for your own photography website and blog, but don’t want to deal with the technical challenges on your own? In that case, I strongly recommend you join the Prime Focus Marketing Success Group. This is the place to get personalized help from me as well as join our regular Q&A meetings and participate in our private Facebook community of like-minded photography professionals. You’ll have access to all of that, in addition to ALL of my courses and workshops to help with your online marketing. One thing that hasn’t changed much at all in the world of SEO that can really help your website and blog rank in the search results is to acquire valuable links from other websites. This is easier said than done, and a lot harder to manipulate than it used to be, which is why Google still uses links as a major ranking factor. While you should never take part in dubious link-sharing schemes, or pay for links, there are still some good ways you can get good quality links to your website without resorting to any shady tactics, and I’ll share 5 of those with you here. The first one is to capitalize on the value of online reviews. I mean, who better for Google to look to when it comes to evaluating the relative quality of local professional photographers than the people who are actually using those services? With the prevalence of socially-oriented review websites, it’s easier than ever to remind your clients to leave a review of their photography experience on their favorite review site, and also on your Google plus local page, which is one of the few remaining reasons for having a Google+ presence at all these days. Obviously, it’s important not to interfere with the review process, other than making it easy for them. For example, don’t copy and paste reviews from one site to another, other than to collect the best ones as testimonials for your own website, and it should go without saying that fake reviews are an absolute no-no, but you’d be amazed at how many people are posting fake reviews for themselves. Also, don’t get too worried if you don’t see 5 star ratings across the board – most people are smart enough to know that there will be some 3 or 4 star reviews out there – anything else just looks unnatural anyway and might raise a red flag with Google. And, whatever you do, keep things on a professional footing and don’t get involved in heated online arguments with your clients about their reviews! If this is done right, Google will reward you with higher rankings in the local search results. Another effective and valuable strategy is to repurpose your content in different forms and places across the web. In modern marketing circles this is sometimes also referred to by the new buzzword “adaptive content” because the content is adapted to suit the audience and platform it’s being created for. For example, you can take your blog posts, and turn them into narrated videos for YouTube and Vimeo. You could then take the audio from those videos and create a podcast if you wanted. You can also write alternate versions of your content and then post those on sites such as LinkedIn, Tumblr, and some of the other free blogging platforms. Do remember to link back to your original content from any place where you post your adapted content, and also make sure it’s unique in its own right, not just copied from the original post or page. A third strategy is one that’s becoming more and more popular, and that’s to become a featured professional photographer on podcasts where you can talk about your work or how it relates to the audience of that specific podcast. I can tell you from my own personal experience that it might sound daunting at first, but it’s actually an awful lot less stressful than you might think, and it can really be a lot of fun. Because most podcasters, such as myself, also publish their show notes on a website, you’ll most likely be given a very valuable website link as part of that post. You also don’t need to restrict your appearance to photography podcasts. Instead, look for anyone doing a podcast where you can add value, such as interior designers, wedding planners, commercial marketers, and anything where there’s a local interest. A long-time favorite link-building strategy is, of course, guest posting on other relevant and related blogs where you can add your perspective to a mutually-shared audience. The key to making this work well is to make sure the links pointing back to your site are part of the natural flow of the article you submit, rather than just part of the generic author bio that appears at the end of the post. Google made some noise in 2014 about discounting (or even penalizing) guest posts that appear to be there simply for link-building alone, so it’s important to make sure your posts are of high quality and not 100% self-promotional. Lastly, don’t forget you can add your thoughts, insights, and questions to other blog articles that talk about topics relevant to what you do. I wouldn’t suggest making this a major part of your link-building strategy, or spending a great deal of time on it, but it can help with both SEO and with attracting visitors to your website or blog. The important thing to remember here is to only ever leave thoughtful and rich comments that add some kind of value to the original article. Comments, for example, that say, “hey, great post!” are just not good enough. Instead, pick one or two points from the post and add your own ideas or questions that spark more discussion.